Casa Particular "Hostal Casa Yaneva"
Our guarantee is to provide personalized services that make the customer feel at home: cleanliness and cleanliness, quality of service, comfort, kindness, hospitality, security and privacy distinguish us. The property has installed the security system against intruders, using sensors and perimeter alarms. On the upper floor live the family, always at your disposal and with the intention of making you feel at home, you will perceive that "IT IS A FAMILY AT THE SERVICE OF YOURS". 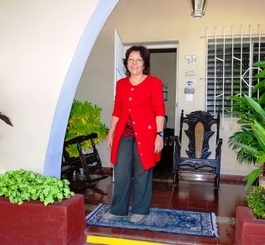 Eva Suárez Castro, owner of Casa Yaneva and founder of Hostal Casa Yaneva, a lawyer, has experience for more than 20 years as a general manager of hotels in Cuba and worked in hotel facilities in Spain, Costa del Sol and Barcelona, ? ?Italy and Brazil , which has allowed her to have knowledge of the provision of services, tastes and preferences of the different markets. From Hostal Yaneva you have the opportunity to visit the city, Santa Lucía Beach and the natural attractions of Camagüey by specialized guides. Eight rooms distributed in three residences, very close to the historic center! Two-level houses with gardens, parking and terraces in the residential area known as América Latina.